Not all targeted mailings has to be expensive! There are many options out there to help you target your clients while staying within budget. If you wanted to do something a little fancier, the United States Post Office just introduced a new product called “Every Door Direct Mail”. The service allows you to send out postcards to targeted local neighborhoods. Word of mouth advertising will always be your least expensive and strongest form of advertising. Make sure to let them know the type of clients you are looking for your business. 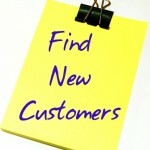 What ways do you find new clients? Next Next post: How Well Do You Handle Customer Complaints?